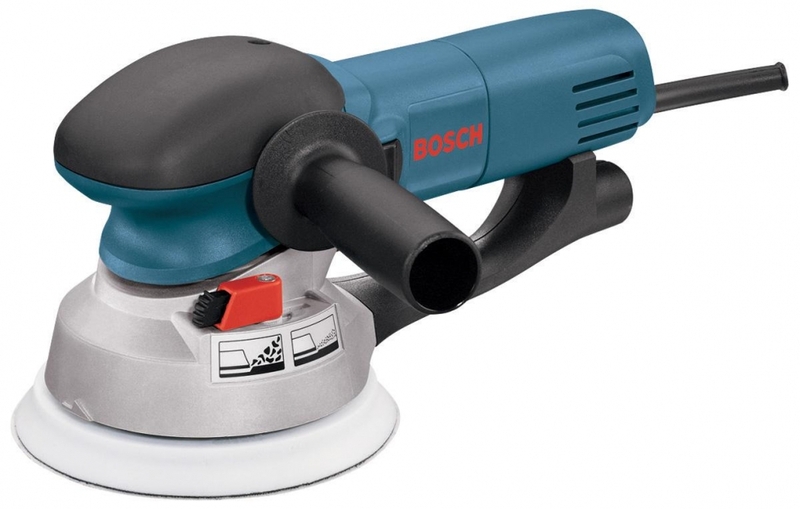 The Bosch 1250DEVS 6" Orbital Sander has two sanding modes: random orbit mode for normal stock removal or fine finishing, and an aggressive "Turbo" drive eccentric orbit mode that operates at five times the regular rate, in order to remove rougher stock. Its simple sanding mode selector switch quickly changes back and forth between the two modes, as your projects require it. The powerful 6.5 amp variable speed motor matches the tool's speed to the task, for a smooth result on all surfaces. This model is crammed with convenient, powerful features, including a soft start function that tones down the start-up torque and a variable speed dial that makes it extra easy to match your working speed to the project. It also has Constant Response circuitry that maintains the pad speed under heavy loads, while simultaneously protecting against overloads. An integral pad dampening system helps prevent swirl marks, plus a passive dust collection system. The 1250DEVS uses 6-hole, 6" hook-and-loop discs.